There is a lot of confusion about the Pickups; this is hardly surprising because there are lots of Pickups (and Hamers and Ashworths and Tricketts) in the Newchurch-in-Rossendale area. 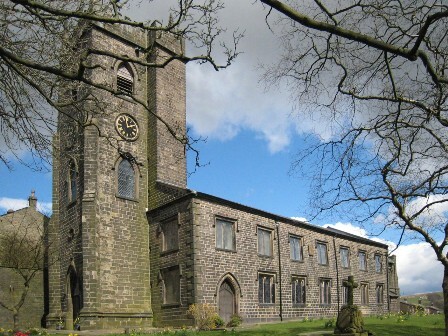 Our James Pickup was born in Crawshaw Booth in 1827 and was christened at St Mary and All Saints, Goodshaw on 18th August 1827. His father is John Pickup and his mother, Jane; I haven't managed to find her maiden name yet. I cannot find James and his parents in the 1841 census. James married Ann Trickett on 2nd October 1848 at St Nicholas in Newchurch. James lived at Waterside and was a weaver; his father was John Pickup who was a dyer. Ann lived at Edgeside and was also a weaver; her father was Samuel Trickett who was also a weaver. Their witnesses were Lawrence Edmondson and Abraham Holt. After confusion about the name and age of Jane Pickup (1855-1923) I did some more digging and found that there are two James Pickup's who married someone called Ann, i.e. one married an Ann Strettell in 1849 and another married Ann Trickett in 1848. Looking at the on-line parish records is part of the problem because there only seems to be records relating to James Pickup and Ann having various children - but these are all Ann Strettell. It is worth pointing out that some family researchers have John William (1857) and Thomas N. (1863) as the children of James Pickup and Ann Trickett but these are the children of James Pickup and Ann Strettall. James and Ann Trickett do not appear to be included in the Lancashire on-line parish records. However, they are definitely included in the Lancashire births, marriages and deaths (BDMs) website. As if this wasn't problematic enough, I also discovered that there was a Peter Pickup who married Alice Trickett in Haslingden in 1842. This means that whilst searching the Lancashire BDMs, many more children were born Pickup to a mother with a maiden name of Trickett! This suggests that when they married in October 1848, Ann was pregnant as their first child, Elizabeth was born in 1848 but died the following year. Twins, Jane Ann and William Henry came next but they also died in infancy, as did their fourth child, John who was born and died in 1850. In 1851 the family are living in Edgeside, Newchurch. James is 23 years old and a power loom weaver, Ann is the same age and their fifth child, John Henry is one month old. By 1861 the family had moved to Bridleway. James was 33 and was now a cotton waste dealer; Ann was also 33. John Henry is now 10 years old and he has been joined by James Ormerod who is 8, Jane (my great, grandmother) who is 6 and Samuel who is 3. All were born at Newchurch. According to Lancashire BDMs, James and Ann had two further children, Joseph and Ann who both died in infancy. I'm not sure when Joseph died, Lancashire BMDs has him being born in 1859 and he is not present in the 1861 census. The only Joseph Pickup in the Lancashire BMDs who died at under one year of age during this period was recorded as living in Heywood, Rochdale. It is possible this is the same one as Rochdale isn't too far away from Rossendale. Ann was probably born after the 1861 but died the following year. By 1871 the family had moved to Turnpike and both James and Ann had now become bread bakers. We must remember that the Cotton Famine occurred in Lancashire during the period 1862-64 which could account for James and Ann becoming bread bakers. James and Ann are now both 43 years old; their son John Henry is 20 and a book keeper; James Ormerod is 18 and is also a bread baker, Jane is 16 and a cotton weaver whilst Samuel is 13 and at school. By 1881 James and Ann had moved to Woodleigh Bank, Newchurch and James was now a drysalter confectioner manufacturer. All of the children had left home to get married whilst James Ormerod was still at home. He was 27 and a warehouseman. Back to James and Ann. In 1891 they are living at 556 Newchurch Road, Newchurch. They are now 63 years old and their son, James Ormerod, who is now 38 years old and is single, is living with them. The family have now changed business and are all 'grocer tea dealers'. James dies either in 1891 or 1895 or 1897 - I need to send off for the death certificate to confirm which date.